And a piece of toast. (Be not afraid, I shan’t channel Gertrude Stein.) I’m just trying to wrap my mind around two genre-bending gourmands which use milk-and-toast accords in novel ways: Serge Lutens Douce Amère (2000) and Thierry Mugler Miroir des Envies (2007). Neither is on my usual bill of fare, being neither vintage nor terribly atmospheric. My tastes run to moody perfumes, perfumes that evoke paintings, landscapes, a longed-for past, even music. Douce Amère and Miroir des Envies are un-nostalgic scents which speak to me, rather, as a mother to her child in what, for lack of a more apt term, I will call “kitchen tones.” They invite us to a table. But not just any table. Christopher Sheldrake’s Douce Amère owes much of its intrigue to wormwood, which, by sheer dint of the name, could not be farther from such a comforting place as the kitchen table. But dried fruits and spices conspire there to make artemisia absinthium a companionable bedfellow. Far indeed are we from the artemisic opening of, say, Yatagan. Rather, we are presented with something resembling a blanc-mange in which almonds have been replaced with licorice and the top has been lightly dusted with jasmine and some type of sharp, dark chocolate. 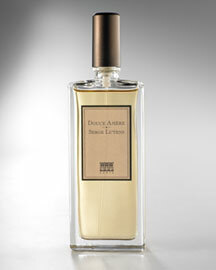 After a few minutes on the skin Douce Amère settles down to light cedar and slightly sweet spiced milk. It is creamy and lovable and addictive – a pleasant alternative to scents with powdery drydowns, like Lorenzo Villoresi’s Teint de Neige. 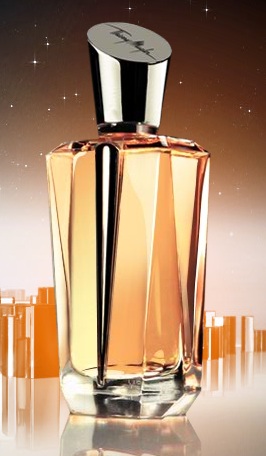 As for the toast (what wine geeks call pain-grillé), perfumers Louise Turner and Christine Nagel of Givaudan succeed in serving it up in their brilliant, otherworldly tour de force for Thierry Mugler: Miroir des Envies (Mirror of Desires). Given a Givaudan lab with all the great naturals and premium synthetics I don’t know what would possess me to do bread, but these gals obviously knew what they were doing. Toast is one of those things that I like to taste in a good glass of Meursault or Champagne, but on the skin I’d never have imagined how well it works with a jasmine-dominated floral accord. And what’s more, it’s surprisingly unisex. Put this on the list with L’Artisan Parfumeur’s bready iris Bois Farine and reacquaint yourself with the aroma. Clearly, those envies wanted something crunchy (knackig as the Germans say) to sink their teeth into. Miroir des Envies it is. I'll seek this out, to sniff. Douce Amere I loved- in minute quantities. I could never 'get' Douce Amere. There was so much talk about it smelling like Absinthe, but it smells nothing like my La Fee Absinthe in my drinks cupboard..haven't tried drinking the DA though. As much as they share some characteristics there is quite the chasm betwixt the twain. Chaya dear, MdE is positively post-space-age in its creation of an otherworldly blossom that IMHO is not a skin-scent. It definitely does throw. As for DA, Barry, the absinthe connection is a loose one (it's anisic, ie. wild fennel, artemisia, celery). Miroir des Envies duly noted! Thanks. Ya know, I'd never have thought of DA as a foody scent. For me, it's pure melancholy, the sort of sadness tinged with hope you experience when poised between one part of your life and the other.... I find it sublimely beautiful and evocative.